I’ve sensed it for a while now. The dread. It’s building… Errands. The dreaded errands. Run to the bank. Grab valentines for the class party. Drop off the library books. Whew! I arrive home only to find I’ve forgotten to buy a necessity for our family. I sigh heavy, knowing these things only drain the minutes of my day from doing something I would deem as significant. Reading with my boys, laughing with my husband, making the house hospitable for our evening gathering, writing- putting words to inspire and draw people deeper, onto page. But it’s not just the dread, beneath this dread, I get this nagging suspicion. There’s this sense that day upon day of mundane tasks and things won’t actually add up to a significant life. This is the real dread. That my life won’t actually end in significance, that it will end in the mundane tasks. Surely, people who are “out there” inventing programs and machines that will change people’s lives- that is significant. People who are investing into the next generation- that is significant. People who save people every day- first responders and police officers. Yes, that is significant work, I think. I tend to think that surely THOSE people who have found greatness in our society have special anointing or circumstances, which has catapulted them towards a life of significant impact. Their lives are nothing like mine. They are the special ones. Maybe you, too have thought this way. We watch the world class athletes on the Olympics and see the gold medal runs, and yet, don’t see all the monotony of the runs they put in day after day, twelve and fourteen hours in the cold, training their bodies to compete when no one else is watching. And we don’t see that their lives are actually very normal. They too live very ordinary lives. But the difference between them and us is what they’ve chosen to believe about and do with their ordinary lives. And that has made all the difference. Because when we compare our lives to those we see around us, it makes us forget about the power we already have. This comparison diminishes the power of OUR lives. The one glorious life we have to live. Comparison it’s like a vacuum, sucking all the power out of our own lives for the sake of trying to live someone else’s. We even hail the great leaders and people of faith we find straddling the pages of scripture. And rightly so. But also for the wrong reasons. We hail them, thinking they were so great for what they did, or accomplished, but we forget the deepest truth about many of them: that they were just ordinary people who allowed God to use their ordinary lives for his Kingdom work. Most of the heroes of our faith were just like us. David was a misfit, a scrawny boy, who worked in the most mundane of professions, sheepherding. Joseph was the little annoying brother. Moses was the adopted one. Sarah was a really old woman. Anna was a woman, an outcast. Matthew worked for the IRS. When we view the lives of those in scripture this way, they're not exactly the high and lofty lives of significance that we hail in our society. 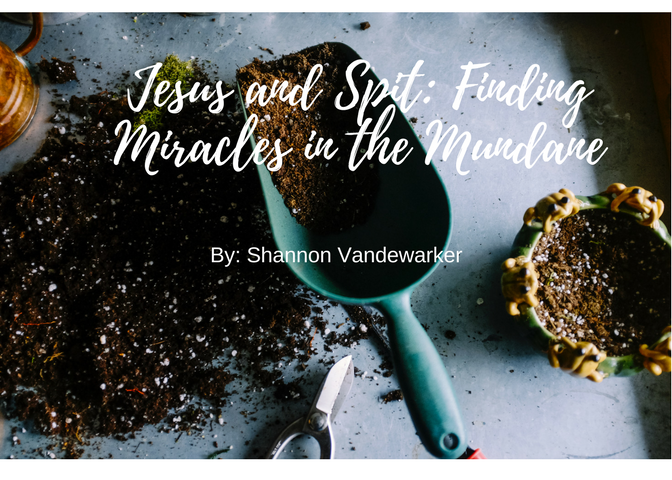 But just because the circumstances of their lives weren’t ideal for impact making, or so we may think, they each had one thing in common: they had a God who specialized in using the ordinary nature of life to do great things. And it makes me wonder, is all this talk about lack of significance, really a lack of eternal perspective? I open up the book, and read this. In fact, only about a dozen of her poems were published during her 56-year lifetime. She didn’t know the significance of her work, when she was penning it. But that didn’t mean that she stopped writing. Emily Dickenson’s aim wasn’t to become a great poet- remembered for many generations after her death. Her aim was to describe the world, and her experience in the world as best as she could. Worrying about the significance of your work, can derail you from the important work you’re doing in your ordinary life. Merely because your life doesn’t seem to be making a great difference or impact or because you don’t see the effects of your life, doesn’t mean God isn’t building something great through you. Focusing on the effects of your life isn’t the point. The point is showing up and being FAITHFUL today. Your job is to stick with God, listening to His voice, being faithful to His calls- TODAY, while it’s still called TODAY, as the book of Hebrews encourages us to do. The fact that you have agency and power in your ordinary everyday life, means your life still has great significance. Merely because you are alive, the God of universe has stamped your life, and has deemed you as SIGNIFICANT! You have been created by a deeply creative God who has given you the life you have. It is a life infused with divine circumstance, giftedness and blessedness. You can stay focused on all the reasons why you aren’t as equipped or set up as the people you admire. You can focus on all the reasons why you’re just normal and ordinary. OR you can take your one unique and precious life and choose to believe that God is attentive enough to your life and determined to use its ordinariness to make deep reservoirs of impact in the world. It’s up to you. It’s all about perspective. This side of heaven, we probably won’t know the impact our life has on the lives of others. But remember, that’s not the point. 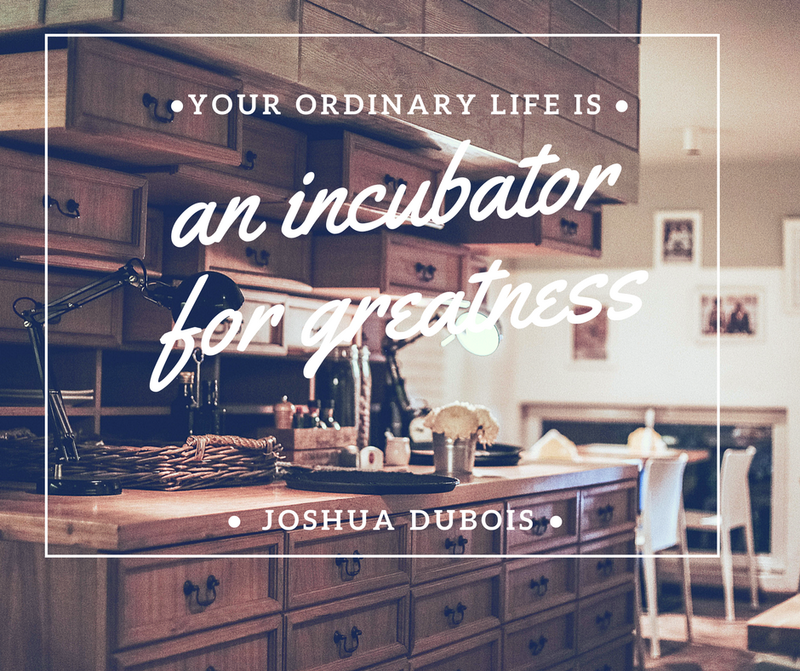 This one life you’ve been given IS an incubator for greatness. Great, maybe not in the eyes of the world, but deeply significant in the eternal Kingdom, God is building, here and now. Today, in the ordinary, you are called to faithfulness. You are called to living this one glorious life, in all its monotony, in the midst of the mundane and the ordinary- with everything you have. Not to make a name for yourself, but for the sake of Jesus, who is working in and through you for the sake of building His Kingdom. Today is the day you stopped believing that you don’t have anything to offer because you’re too young, or too old or that you aren’t as qualified as the next person to be used by God, or because your circumstances are preventing you from it. Anyone can be used, especially YOU! Today is the day to step into your ordinary life, because it is indeed an incubator for greatness, and the power of God is backing you each step of the day.